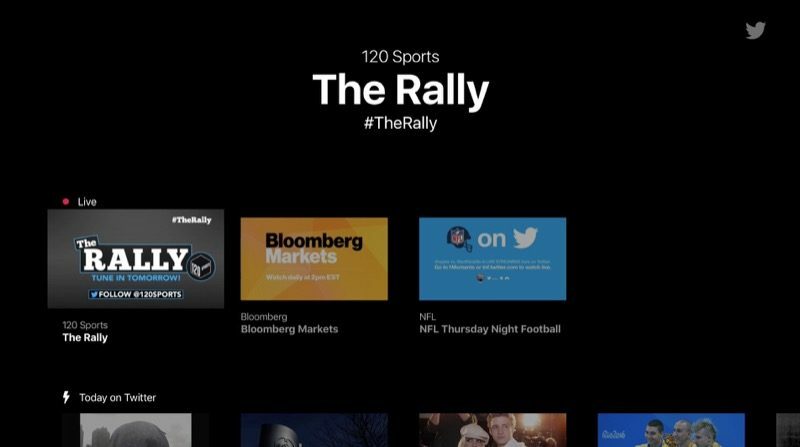 Twitter today launched an app for the Apple TV, letting users of Apple's fourth-generation set-top box "consume the best of Twitter," mainly focusing on live-streaming video. 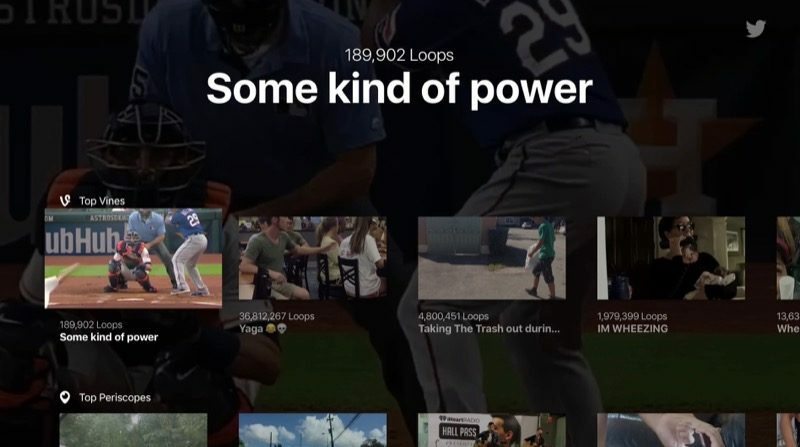 The company said that the app will encompass all live-streaming content available on Twitter, including the ability for users to watch Thursday Night Football, which was rumored in August. In addition to NFL content, there will be live streams of videos from MLB Advanced Media, NBA, Pac 12 Networks, Campus Insiders, Cheddar and Bloomberg News. Twitter said that top Tweets, Vines, and Periscope videos will also be made available, but the app stops short of being a full-fledged extension of the web and mobile experiences, since each user's personal timeline won't be in the new app. "These devices will bring Twitter's live streaming video experience to life on the TV screen," said Anthony Noto, chief financial officer at Twitter. "Twitter has always been a great complement to TV, and now fans can enjoy even more premium video with live Tweets — and the best content on Twitter — right from their TVs. We're excited to introduce this new experience to people, without requiring a paywall or having to log in to Twitter." On the plus side, anyone will be able to log in and use Twitter on Apple TV, "regardless of whether they have a Twitter account or a pay TV subscription." The app is also coming to Amazon Fire TV and Xbox One, but Apple TV users will gain exclusive access to "premium" live videos and be able to watch multiple clips "through a seamless side-by-side video experience." Twitter on Apple TV is available globally, so anyone interested can check out the app for free in the Apple TV App Store starting today. Would be nice if this came to ATV3. I am very interested in watching Thursday Night Football and as a cord-cutter I was happy to hear Twitter will be streaming some of the games. Sure, there are others way to achieve my aim, but it's upsetting to be left out in the cold for having the last generation ATV. You're left out in the cold because your box doesn't, and ever did, have an App Store. The ATV3 does everything it ever has and continues to function but it wouldn't be realistic to expect it to basically transform into the ATV4. Twitter should first fix Twitter.